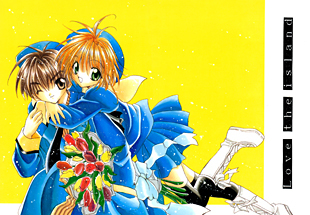 Summary: Syaoran stews over his growing interest in Sakura leading up to and after a Christmas party at Tomoyo’s house. Two versions are available: The full version, which contains a three-page adult scene (just a blurb, no bearing on the actual story), and the censored version, which is available for those who prefer not to download anything of adult nature with this title. 12 Comments on "Love the Island"
For those interested in the full version, it might be worth mentioning that the “scene” in question is a bit on the non-con side, so that’s a big pass to anyone who doesn’t dig that kind of thing. weee . haha. nice. :) thanks ! downloaded the safe version. how do you open these exactly….because when i try to download it, it makes it a file to open on iTunes and it doesnt seem to work…..
Sure, have you downloaded either winzip or winrar? You’ll be able to open the files with either of them. It was a great doujin, however i downloaded the full version without reading what it would have in the middle so i was reading that cute thing…and then that popped up ._. and when a GUY ssys something of that nature is wrong believe me its WROOONG, kinda dissapointing cuz of that BUUUT read the safe version so tho was fine, next time ill read whats in the authors comments. Apparently your friend neglected to pass on that I’ve already said “yes” – twice. All messages pertaining to the subject have been deleted, as we prefer messages of this nature be posted in the information/faq section. This message, likewise, will be deleted in about 48 hours, which should be enough time for you to see this, I hope.